Dean Chambers launched the website UnskewedPolls.com in the final months of the election to counter what he saw as a Democratic bias in most presidential polls. Chambers’ site was a hit among Fox-watching, reality-denying conservatives. 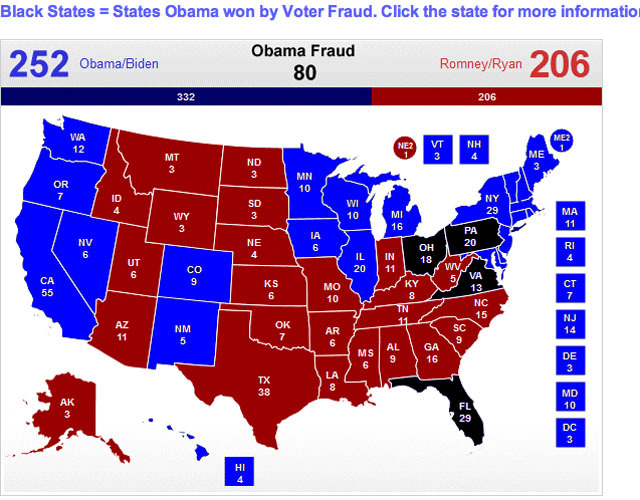 He predicted Romney would win 275 electoral college votes and Obama would win 263. Chambers was, as he later admitted, horribly, embarrassingly wrong. But the embarrassment continues. What’s not crazy? “Things like the 59 voting divisions of Philadelphia where Romney received zero votes,” says Chambers. “Even Larry Sabato said that should be looked into.” (I’ve looked into this: 57 precincts gave McCain no votes in 2008. There’s such a thing as a 99 percent Democratic precinct, and such a thing as a 99 percent Republican precinct.) Same story in Ohio. “Some of the precincts or divisions in cleveland were projected to be 99 percent Obama. That’s a part of the state where it’s known that a lot of ballot box scamming has been done in the past. There were isolated reports of people voting for Romney and having votes changed, though they didn’t get much attention. Fortunately, Chambers’ failure to come with a country mile of predicting the presidential race means no one will take his voter fraud jeremiad seriously. Not even the Drudge Report, an avid endorser Chambers’ Unskewed efforts, has stumped for his latest venture.